Level 3-6 is the sixth level of Fire Mountain in Mario vs. Donkey Kong. The high score for this level is 27000. The level opens with a cinematic showing Mario grabbing a Key and tossing it onto an above platform, followed by performing a Backflip onto it to avoid the rising lava. The player starts next to the locked door as the lava rises to the player's platform. 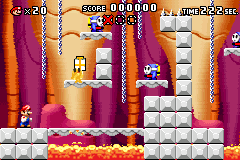 After waiting for the lava to lower, the player needs to ride the moving lift down to the next platform and cross the disintegrating to reach a blue Color Switch and a 1-Up Mushroom. With the blue Color Switch active, the player can drop down onto blue platforms to reach a red Color Switch that needs to be pressed. Riding down one of the moving lifts, the player can collect the Key, which needs to be carried back up to the top of the level before the lava rises back up. Riding the two lifts up to the left platform, the player can use a Springboard to reach the group of red platforms leading to the first lift. Moving back across the first platform to the left will have the player reach the locked door. 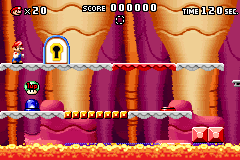 In the second area, the player has to cross a bridge with a Lava Bubble jumping up from below. The player has to then climb up some ropes while avoiding the fire of Katakata Kaen Heihōs. At the top of the first pair of ropes, the player needs to jump left and climb up the next pair of ropes to reach the platform above. After jumping across to another platform and jumping off of another rope, the player will land on a disintegrating platform with a 1-Up Mushroom over it before coming to the Mini Mario. Red: In the first area, on the platform opposite of the Key. The blue Color Switch needs to be activated. Yellow: In the second area, directly above where the Lava Bubble jumps up. The player can either loop around using the ropes or do a Handstand Double Jump from below to reach the platform. Blue: In the second area, below the Mini Mario and over the far-right platform. The player needs to avoid Ninjis and another Lava Bubble to reach it.